Buy 6, Get The Most EXPENSIVE 1 FREE!!! 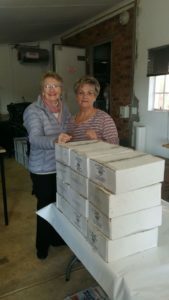 Black Mountain Foods supporting the local community with a donation of Freezerland crumbed chicken to the NG Suiderlig church in Krugersdorp. BLACK MOUNTAIN MEATS FACTORY SHOP – NOW AT EAST RAND VALUE MALL!!! OUR BLACK MOUNTAIN FACTORY SHOP IS OPEN & WE STILL HAVE GREAT SPECIALS NOT TO BE MISSED!